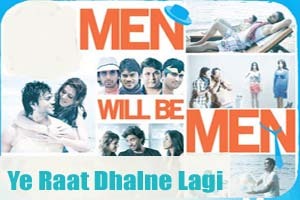 Lyrics Of Ye Raat Dhalne Lagi Hai From Movie - Men Will Be Men (2011): A Playful song sung by Meenal Jain Featuring Zeenal Kamdar. The Audio of this song is available on Youtube. Lyrics of "Ye Raat Dhalne Lagi Hai "
Lyrics in Hindi (Unicode) of "ये रात ढलने लगी है"